The thought of making decorated sugar cookies has intimidated me for years. The whole process seems so laborious – making the dough, cutting out shapes, making the royal icing in a multitude of colors, and then actually decorating the cookies. This year, however, I wanted to give a special Valentine’s Day treat to Audrey, a friend’s 5-year old daughter. She loves cookies, especially sparkly ones. So, I decided that I would make heart-shaped cookies for a sweet little girl. As it turned out, these cookies were a breeze to make. Both the cookie dough and royal icing recipes from Annie’s Eats were concise and well-written, with clear instructions. The photos from the royal icing tutorial were especially helpful to get an idea of the correct consistency. The dough came together easily and after about an hour in the refrigerator, I was able to roll it out smoothly and cut out the heart shapes with no problem. The cookies baked perfectly and, thanks to the addition of both vanilla and almond extract, have a nice flavor. The royal icing was fun to make and I got the hang of piping after a few tries. 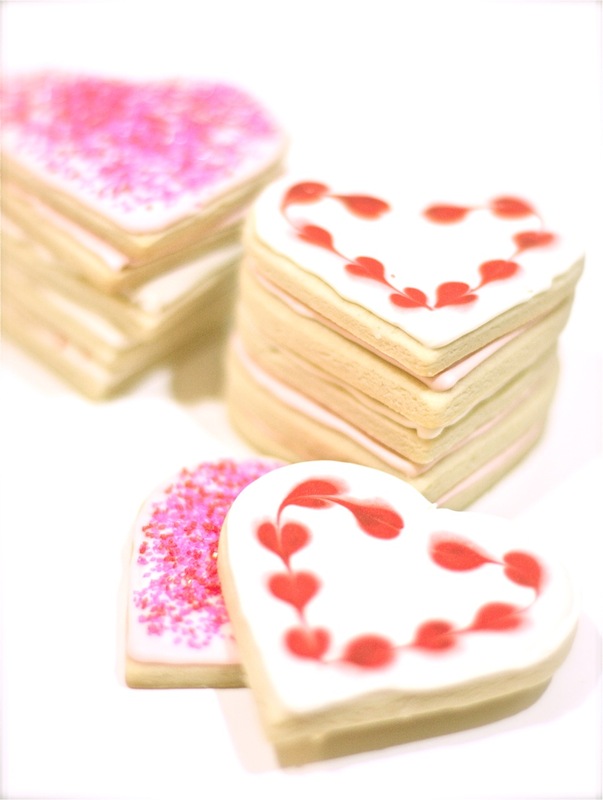 The key is to have the right consistency – stiffer for piping the edges, and thinner for “flooding” the rest of the cookie. Surprisingly, these decorated cookies are not overly sweet, like many store-bought ones I have had. I have to say, I really enjoyed baking these cookies and decorating them. I am really happy with the way they turned out. I especially like the ones with the sugar sprinkles. I think Audrey will too. Since I followed the recipe exactly as written, I won’t be reprinting it here. I have provided the links above for the original recipes that are found in Annie’s Eats. That leaf pattern is gorgeous, Daisy. Good job. I don’t have the patience for things like this. These are professional quality gorgeous! Great job Daisy! 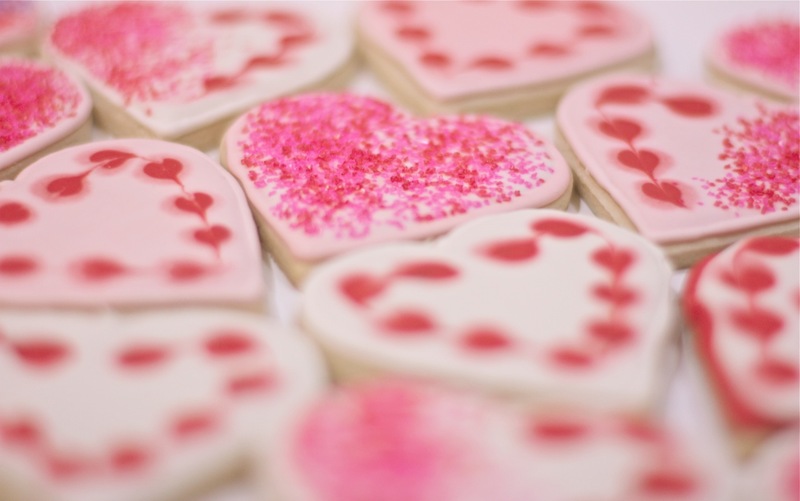 How did that little sweet girl react to your Valentine’s Day cookies? I bet she felt pretty special. That was such a nice thing to do. I wonder how often we forget to make Valentine’s day special for children. Love is about them too after all! so pretty! happy v-day, daisy. They really are beautiful. So fantastically wonderfully decorated, Daisy. I’m so impressed. These cookies are beautiful! Like you I’m intimidated by decorated cookies and tend to avoid royal icing. It’s helpful to know that it’s easier than it looks! What a nice gift for Audrey. So glad my recipes and tutorial were useful to you. The cookies look great!